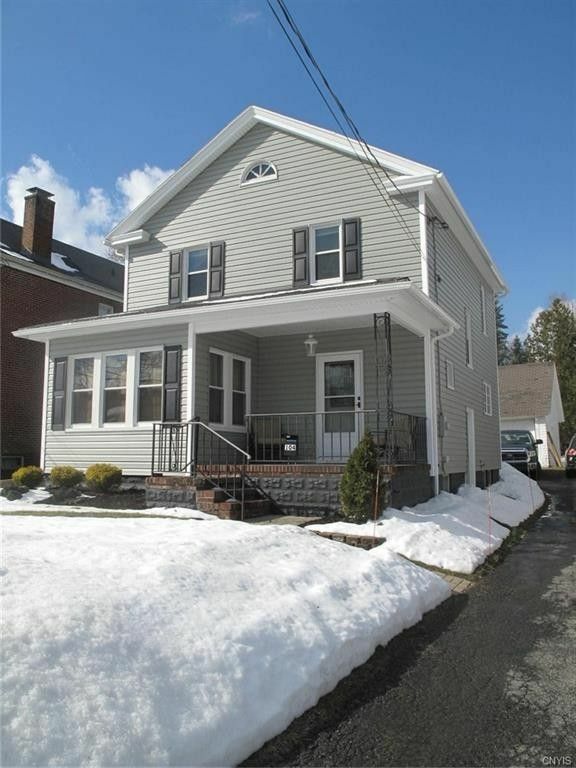 You will be impressed by the bright and warm feeling of this Village colonial that was the former home of the Mayor of Solvay. It is in pristine condition. $32,000+ in recent upgrades and improvements include new vinyl siding; gutters, soffit and facia; replacement windows; exterior doors; landscaping; furnace and central air; rear deck and stone walkway. The modern kitchen and bath along with the natural woodwork, antique doors with arched doorways, brick fireplace, hardwoods, ceramic floors and backsplash, make this an exceptional home. The full attic with stair access is ideal for storage or additional square footage. Solvay electric and extra insulation means low utility bills year-round. Owners are reluctantly leaving the wonderful home due to an unexpected job transfer.